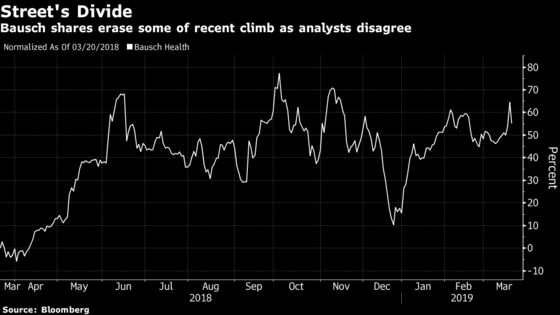 (Bloomberg) -- Bausch Health Cos Inc. got a new bull and reawakened a bear within 14 hours, underscoring yet again how the company acts like a lightning rod on Wall Street. Analysts at SunTrust started coverage of the drugmaker with a buy rating Tuesday afternoon, telling investors that “management is doing the right things to strengthen the business” despite a heavy debt load. The next morning, Bank of America Merrill Lynch analyst Jason Gerberry re-started the bank’s coverage with a sell-equivalent rating, citing “fundamental challenges” in the next leg of the company’s recovery. The shares sank 5.7 percent at 10 a.m. in New York, their biggest intraday drop in a month. The stock closed Tuesday at its highest level since Nov. 14. The company has divided Wall Street for years despite bailing on its former identity, Valeant Pharmaceuticals. Nine of the 18 analysts tracked by Bloomberg recommend buying shares, while the others say hold or sell. The SunTrust analysts praised Bausch Health’s “important pivot to offense” with bolt-on acquisitions. Bank of America Merrill Lynch said a 42 percent gain in the stock this year through Tuesday makes additional upside difficult, especially with inflated sales projections for its product pipeline that will likely drag on margins.